A little while ago I bought the darkmax 220, and recently I wanted to go from FlySky to FrSky. I got the receiver yesterday (XM+). Binding the receiver when without any real pain, I had to look up some video's on YouTube. But when I plug in my receiver to my quad it does not seem to talk to the flight controller, I know that the bind was succesfull because the green LED is on and when I turn off my Taranis it goes red. But it does not go in bleeping mode or anything, and when I connect it so betaflight it also does not show me when I move one of the gimbals. I already made sure I used the correct UART. Is there anything I can do to solve the issue? In the configuration tab make sure you have the receiver mode set to serial based and the serial provider set to SBUS. Did you connect to the SBUS pad, or a different UART? 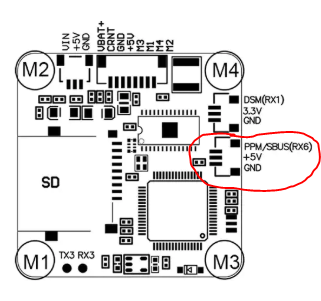 SBUS is an inverted protocol, and I believe only the SBUS pad is inverted on the Omnibus F4 FC. That should work, assuming you enabled Serial Rx on UART 6 in the ports tab.